FRACORA is a fashion shoes brand . 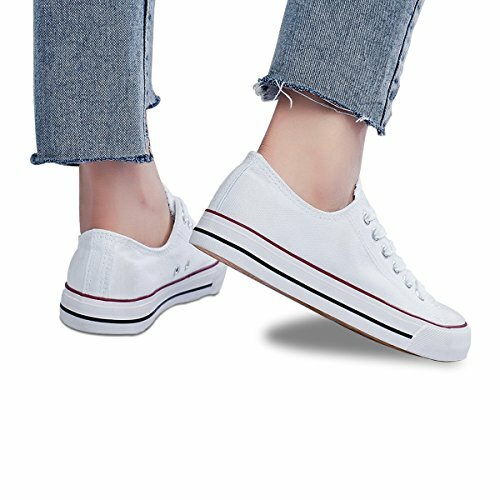 Classic white and canvas sneakers with padded sole are very comfortable and soft for all day wear,washable material that easy to clear ,with adjustable shoeslaces are flexible both for wide and narrow foot. Great for many accasions such as :casual wear in house or in office, hiking ,running , shopping , driving , and gym etc,all year round style ,very suitable especially for summer ,spring ,autumn and well paired with any kind of clothes. FRACORA fashion low top canvas shoes are always the wonderful gift ideal especially for back school gift,birthday,Valentine's ,Halloween,Thanksgiving Day etc . NOTE:due to different people has different foot width,pls check with our size chart pictures and consider your foot width carefull before buy in order to choose a correct shoes for you ,enjoy your shopping at FRACORA store! If you have any questions about this product by FRACORA, contact us by completing and submitting the form below. If you are looking for a specif part number, please include it with your message.